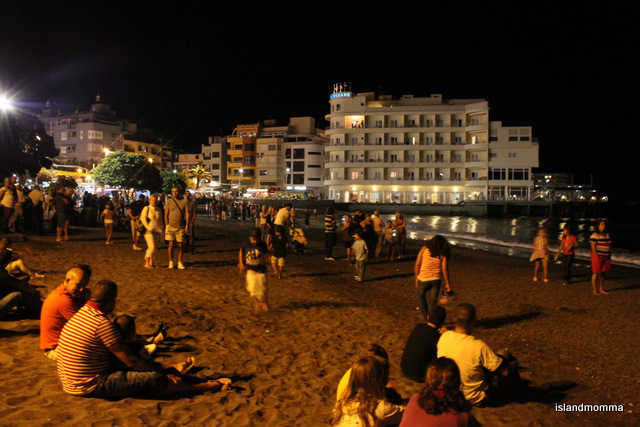 Legend has it that in the early years of the colonization of the Canary Islands, in the 16th century, a boat en route for the New World was passing by the coast of La Gomera, when the crew spotted dazzling lights emanating from a hillside close to the port of San Sebastian. Going ashore to investigate, they found the source of the lights came from a cave, and inside the cave they discovered an image of the Virgin Mary. In awe, they took the statue aboard their boat, but found that they were unable to make any headway, that some strange, unseen force had them held captive. When they were overwhelmed by a huge flock of seagulls, one of which tried to seize the little statue, they decided that this was a sign that the Virgin wished to remain in her cave, and they returned her, and were able to continue the remaining miles to San Sebastian. 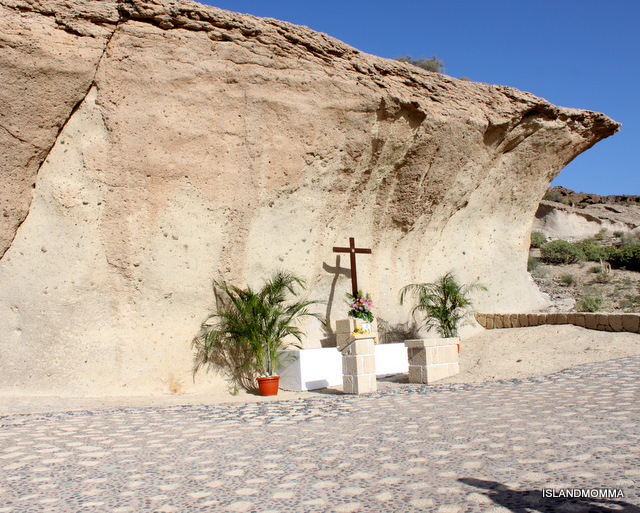 The folk of that town, on hearing their story, made haste to the place, now known as La Puntallana, and in the Virgin’s honor decided to construct a sanctuary for her there – which is where you will find her today, that is, except for a period of about three months, every five years. 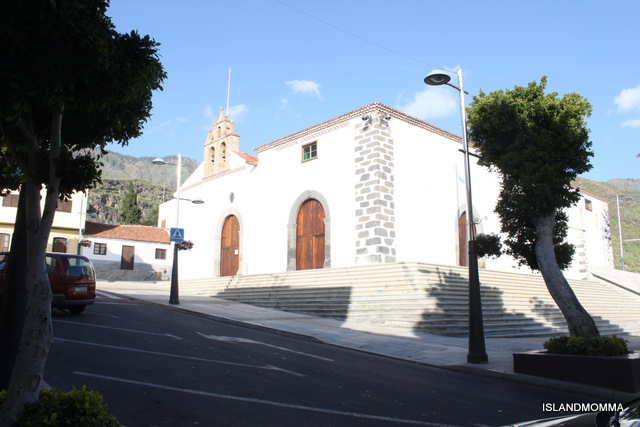 The statue was declared Patroness of the island of La Gomera, and named for Our Lady of Guadalupe, and every five years she leaves her chapel to visit the other churches of this small island. It is a fiesta of some note. In fact, I had delayed my arrival back in October because I thought that port and capital, San Sebastian would be crowded as she began her journey from her sanctuary. 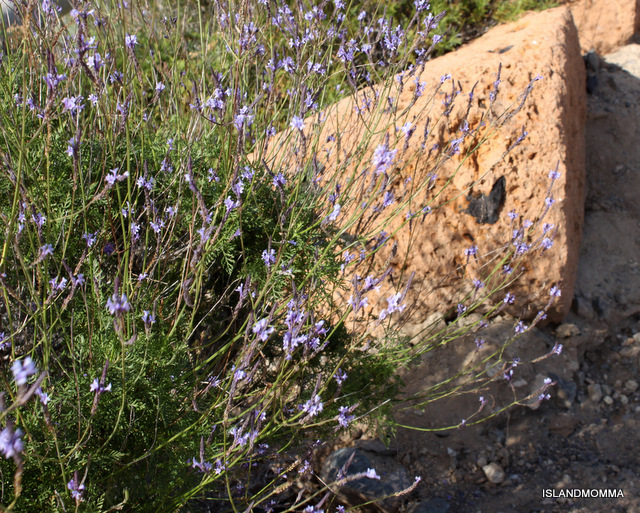 The Canary Islands are steeped in traditions brought or created by the first conquerors who claimed the archipelago, island by island, in the names of Spain and Christianity. 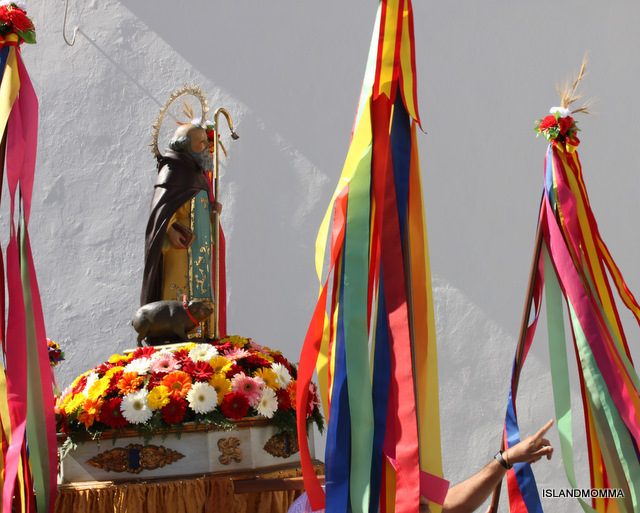 The colorful fiestas and romerias of the islands all center around blessings from or homage to saints or the Virgin Mary. 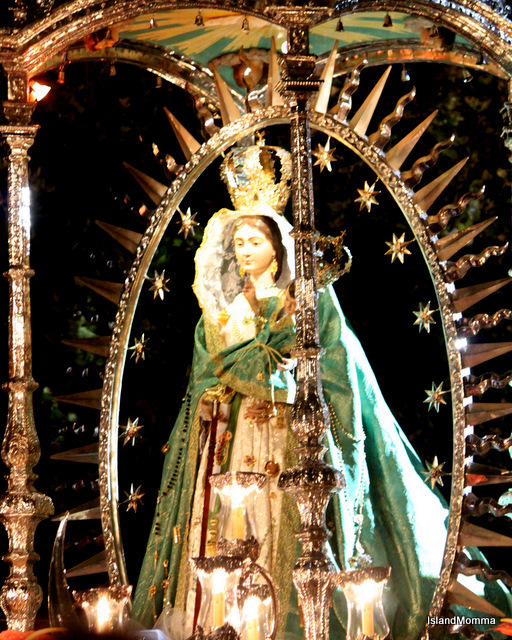 Even the spectacular and Disney-esque Librea de Tegueste features a stroll around the square by the Virgin. 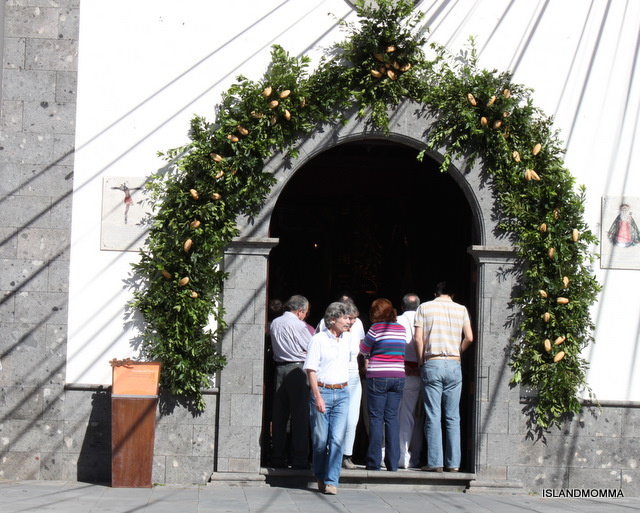 Categories: Canary Islands | Tags: bajada de la virgen de guadalupe, canarian traditions, canary islands, festivals, fiesta, gomeran festivals, gomeran fiestas, la gomera, la virgen de guadalupe, our lady of guadalupe | Permalink. 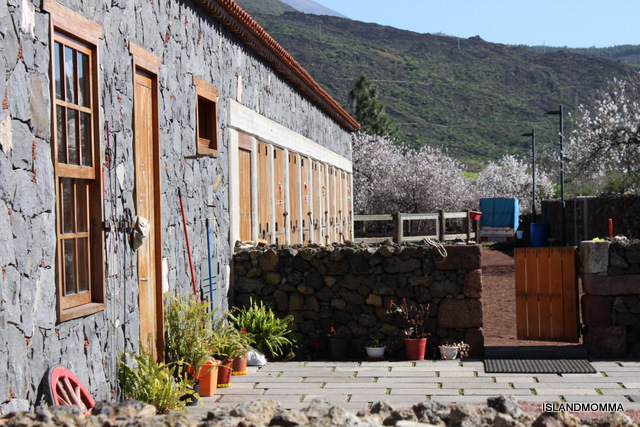 Once upon a time, in the years following the conquest of the Canary Islands in the name of the crown of Castille, in a lush and verdant valley, where mists caressed the surrounding mountain tops, providing moisture for anything growing there, a settlement began to grow. Over the next hundred years or so the settlement thrived, became a village. They named the village Tegueste, and its citizens flourished, how could they not in this most favored spot of the archipelago known as The Fortunate Islands? They grew rich and contented, working on the fertile land. They grew potatoes, maize, all manner of fruit and vegetables and from their vineyards came some of the fine Canary wines so loved in mainland Europe. They built a church and a schoolhouse, and wanted for nothing. When the official army was withdrawn, they formed a citizens’ militia to protect the area. Though the archipelago was under the protection of the Crown of Spain, there were many who tried to claim the islands. Rich as the land was in timber and abundant as the crops were which sprang from its volcanic soil, it was viewed with jealousy by other nations, and targeted by pirates, both those sanctioned by envious countries, and opportunists. The island became a great trading center, poised between three continents, the old Europe, the new worlds across the Atlantic, and the mysterious and unknown continent of Africa. Ships arrived on its shores from all the great trading nations, from Britain and Holland and Portugal, and ships returning from the shores of the new lands in the Caribbean and the newly explored Americas stopped on their way home. In the hundred years or so spanning roughly the mid 16th to the mid 17th century, Europe was in the grip of a terrible plague, the Black Death. Thousands upon thousands of lives were lost, and it was inevitable that, despite being almost 1,000 miles from mainland Europe, the disease would find its way to the islands via the frequent ships which visited. All around Tegueste the folk of other townships and communities began to fall victim to the plague. 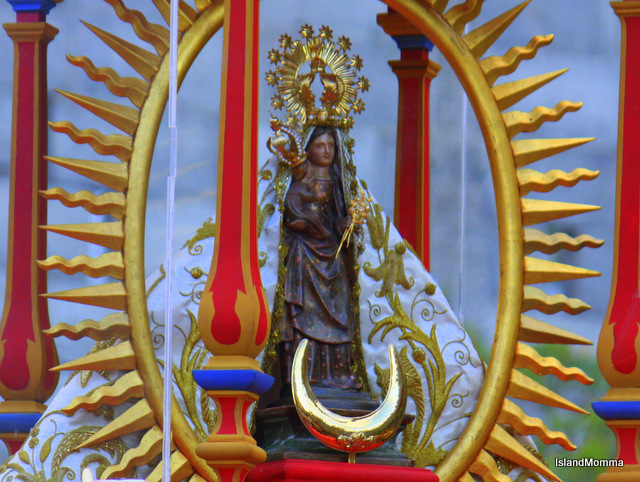 The close-knit community began to dread that it would sooner or later find its way into their corner of paradise, and so they appealed to Our Lady of Remedies (Nuestra Señora de los Remedios or Nuestra Señora del Soccorro) to envelope their community in her protection, so that they would be immune to the spread of the Black Death. 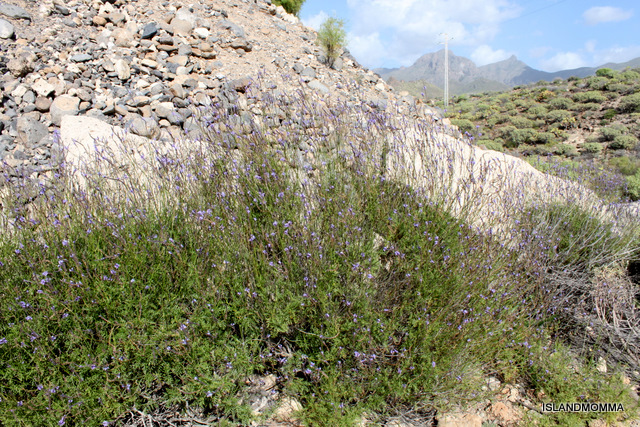 And – thus it was, though in surrounding areas people died, the pueblo of Tegueste was spared. 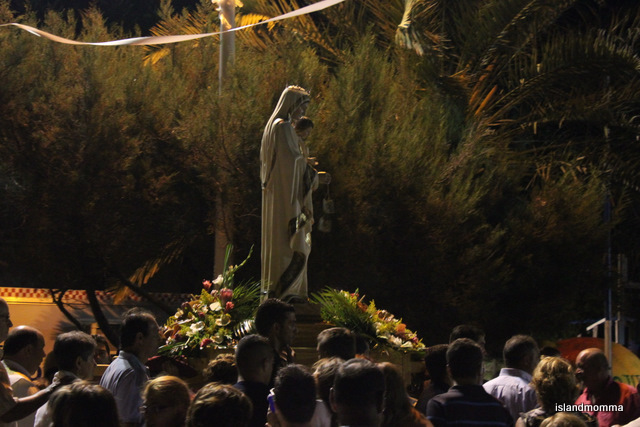 It was the miracle for which they’d prayed, and so every year thereafter, which is now more than 400, the feast day of Our Lady of Remedies is celebrated in the village with passion and gratitude. That’s the real story, in as much as the myths of religion constitute real stories. 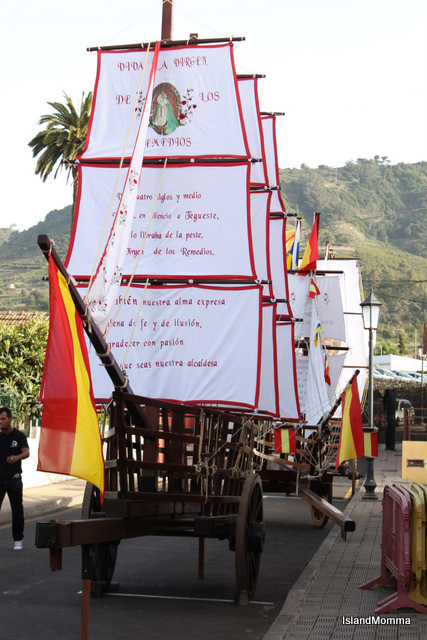 I’d been told that boats and pirates featured heavily in this celebration, and I was very curious as to why, given that Tegueste is, apparently, the only “landlocked” municipality in the Canary Islands – that’s as landlocked as anywhere could be on a small island. It has no coastal boundary at all. 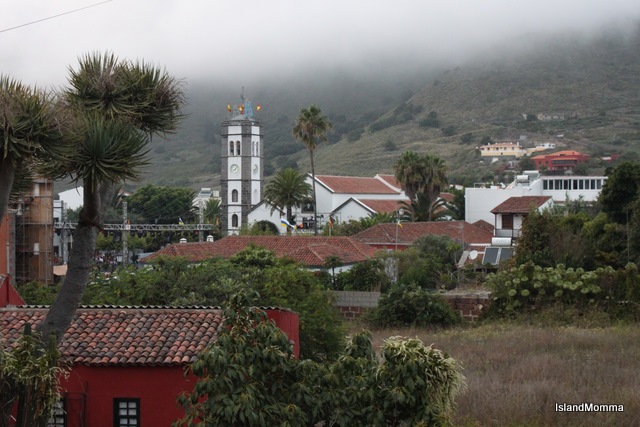 It’s surrounded by other municipalities, though it was a part of La Laguna back in history. 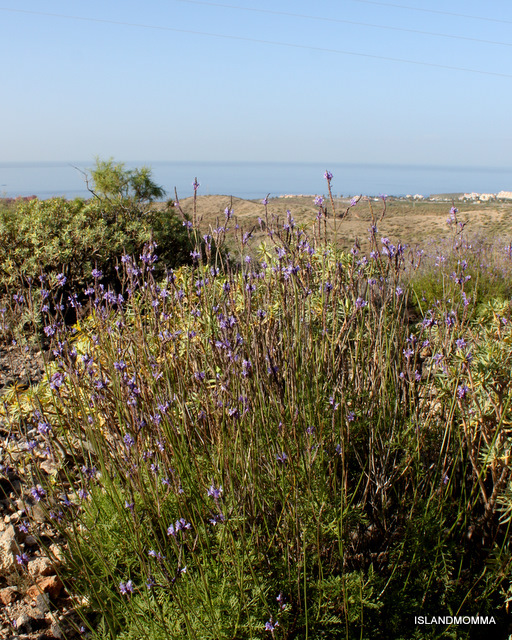 I’d seen the “boats” at the romeria in La Laguna, and I’d heard that they attack the village – hmmm, that was what I couldn’t figure out – how could pirates assail a landlocked town?! 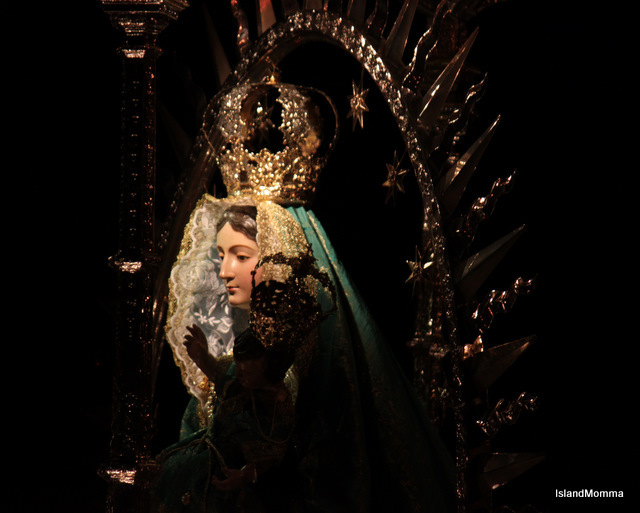 The feast day of Our Lady of Remedies was Friday of last week, and on an island overflowing with celebrations and fiestas, this, I can now report, was the pinnacle – the best I’ve ever seen. 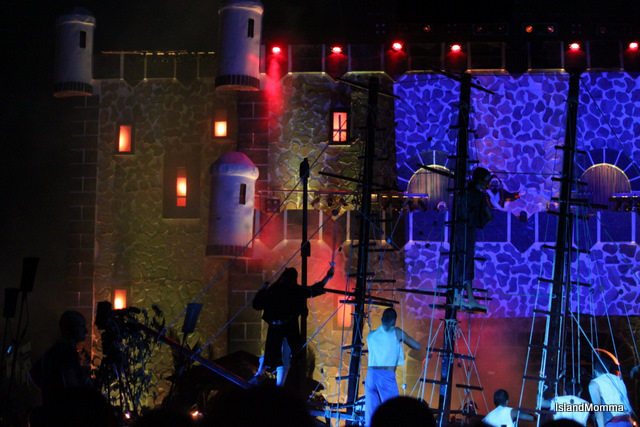 It will give you an idea of the quality and scope of the event if I tell you that it occurs only once every three years, or at least the festival known as La Librea only happens every three years. 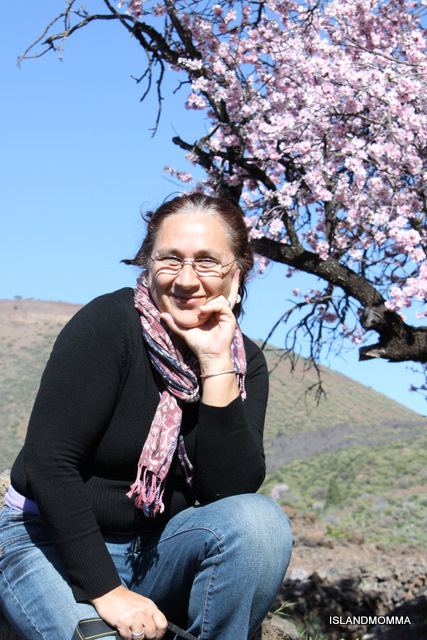 Cristina was the only friend able to make what we knew would be a late night, followed by the drive back south. It was slated to begin at 9.30, and scheduled to last around two and half hours. We arrived more than two hours ahead of that to make sure we had parking and a decent view. That was good planning. The parking bit was easy, and I’m sure it must have been nigh impossible afterwards. 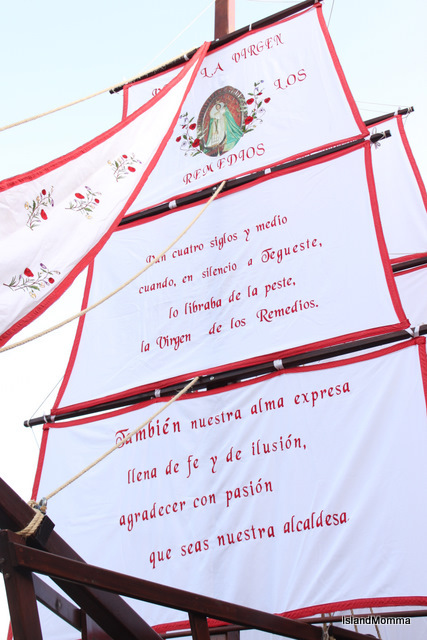 As we ambled down to the square we passed the famous boats, the same ones I’d seen in La Laguna, only now they had sails, which were exquisitely embroidered with prayers, saintly figures, and island scenes, each boat representing a neighbourhood group or community. We crossed to the pretty church square to get an idea of what was happening. Fold-up chairs occupied most of it, rising to platform seating at the back, the sort they have for Carnival or street events, and the entire façade of the town hall, opposite had been converted into a castle, a feat worthy of Hollywood. We could have bagged seats when we arrived and had splendid views, as it was we were peckish, and went in search of tapas, and by the time we arrived back in the church square the best seats were taken, but the ones we had were fine. Although there were times when it would have been much nicer to be able to see just what was happening on the main stage, there were two big screens on the inside of the square, and two more on side streets for those who couldn’t find seating inside. 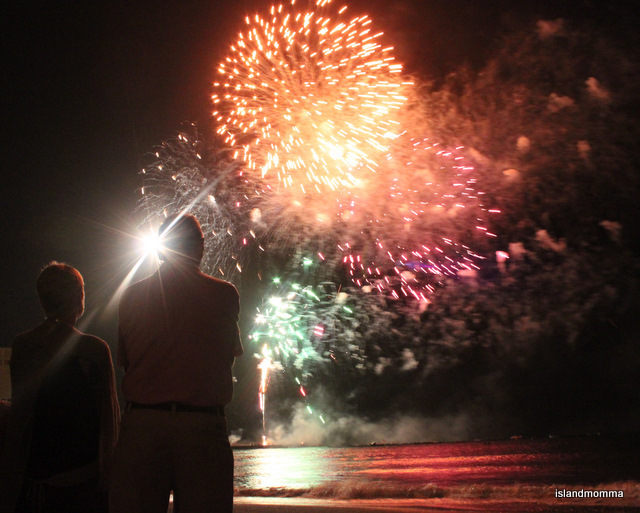 It was forbidden to stand, and we soon saw why, what with the constant movement of the pageant and the fireworks! Remarkably, everything began on time. 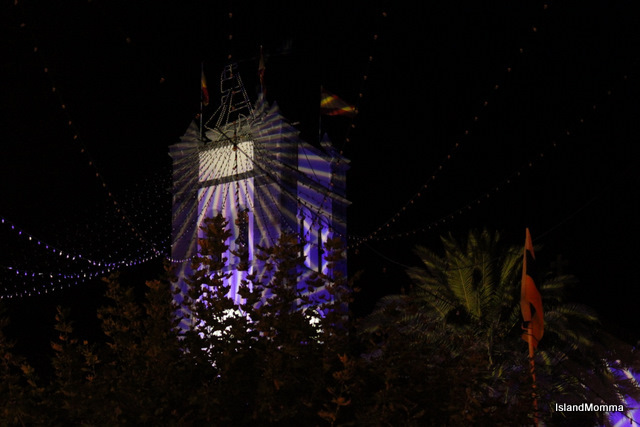 The pretty strings of lights around the church tower and the square were dimmed. 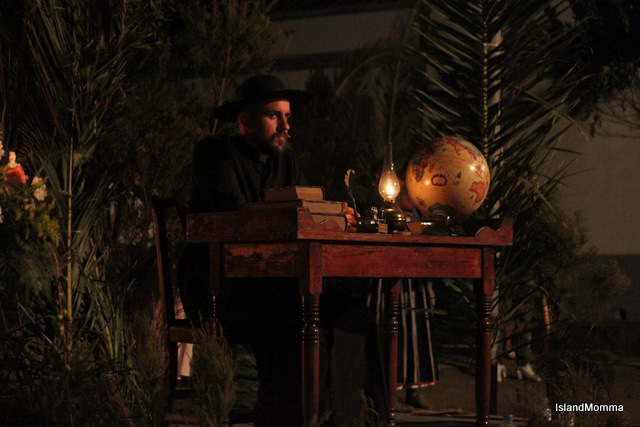 Short scenes from the early days of the hamlet were acted out; almost all of the actors performing very professionally, though nerves were evident once or twice! Scenes happened on the sides of the square as well as on center stage, which meant that everyone really got to see at least something really well. 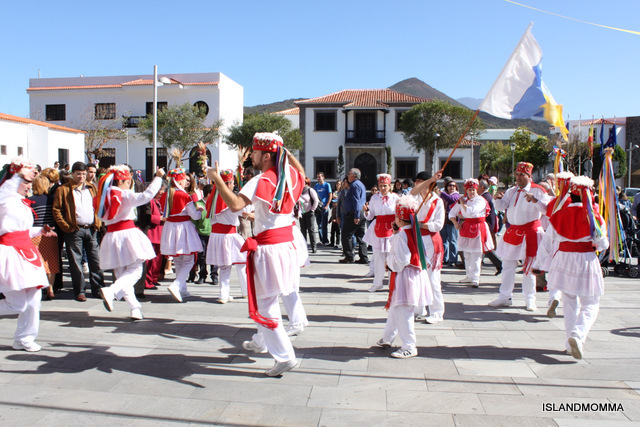 As the tableaux played out, the surrounding streets and the area in front of the “castle” began to fill with people in traditional Canarian dress, and in 17th century costumes, the men who were to form the militia in powered wigs and all, so that from where we sat in the center of the plaza, we began to feel as if we had been taken back in a time machine, and were almost a part of what was happening. I let that wonderful suspension of disbelief envelope me, and gave myself up to the performance. 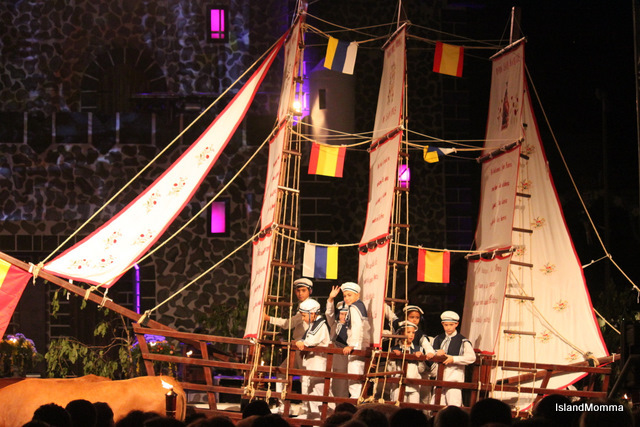 400 local citizens took part in this marvelous spectacle, everyone in superb costume, and looking as if they were enjoying every second. They strolled the streets, they danced, they sang, they wrestled and when the boats, pulled by those stoic oxen, sashayed down from the side street and onto the scene, they were manned by children in those old-fashioned sailor costumes, looking as if they’d just stepped out of “Bednobs and Broomsticks,” and we all oo’ed and ah’d over how cute they were. Intentional, I presume, that they represented a kind of age of innocence, before the attacks which were to come. 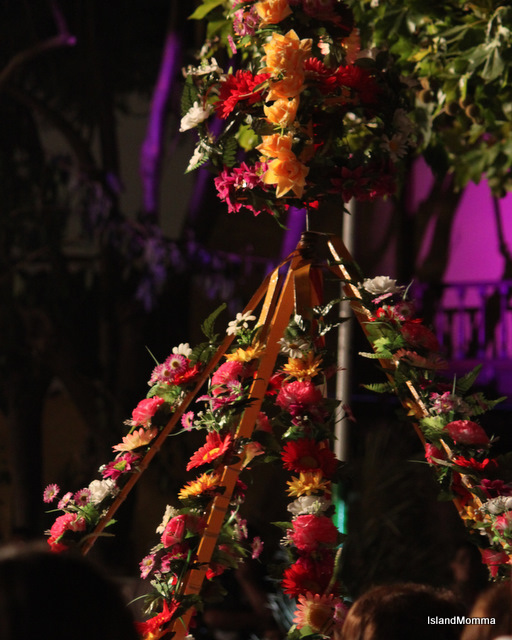 The part I regretted not being able to see in full was the Dance of the Flowers, which is an important part of the festival. In certain areas of the islands maypole dancing is as traditional as it was back in my 50s childhood, though the maypoles I’ve seen have been carried, not static, as the one in our school playground was. 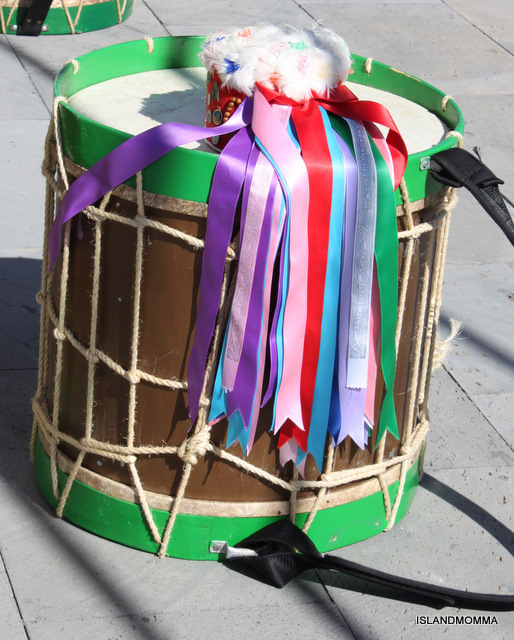 The maypole in this dance, however, had rigid struts, wrapped in flowers, in place of ribbons. All we could see was the top and vague movement of those colorful struts. 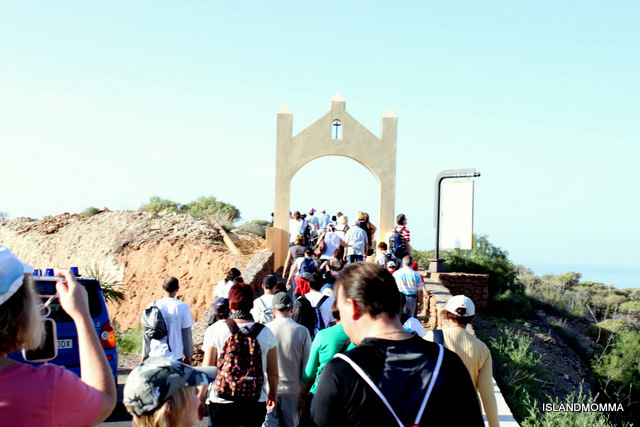 When every citizen and group had been granted permission to enter, and all were gathered together, the religious procession began. Those of you who know me, know very well I’m not an aficionada of things pertaining to conventional religious groups, but on an theatrical level, the emergence of the statue of Mary from the church door was quite impressive, beautifully robed and perfectly lit as she was. As she made her way around the surrounding streets, pausing to admire the whirling catherine wheels which were placed in her path, we were treated to some exceptional musical experiences, most notably a choir which I thought was a professional recording until Cristina dug me in the ribs and nodded her head in their direction. The musical groups are listed in the program, but I have no way of knowing which one it was. Mary returned to her perch in the church, the fun was about to begin. 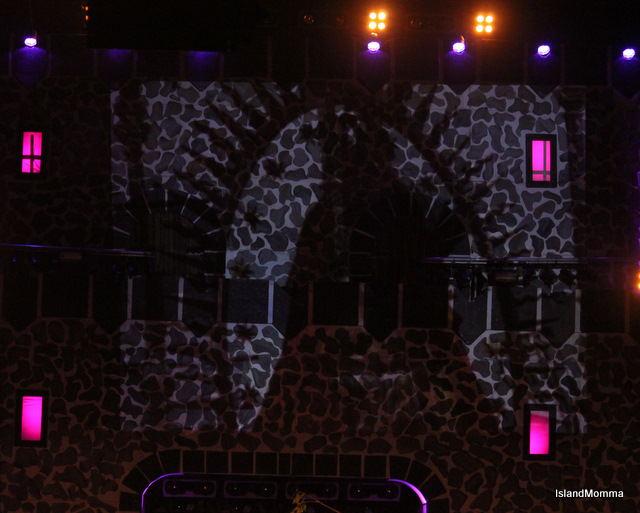 Lights dimmed even more than before, and the figure of the Captain of the Militia appeared on the battlements. Suddenly, out of nowhere, a boat appeared, now shorn of its pretty sails, and crewed, apparently, by any number of Johnny Depp wanabes. The battle was about to begin, as more boats followed. Me, I was already utterly captivated by everything I’d seen, but this was a scenario straight out of Disney World, and executed just as professionally. Canon blazed, guns roared, orders and epithets were screamed, people hung precariously from masts and it was every bit as exciting as Pirates of the Caribbean. My video, shot with my Blackberry, and from too far away can only give you a wee glimpse. Finally, the pirates were vanquished, and the boats wearily circled the scene, they were now pulled by men and not by oxen, and departed. At the beginning sparklers had been distributed, and now was time to light them, as a firm tenor voice launched into the magnificent Ave Maria. Now you don’t have to be religious to enjoy that particular piece of music. It was, in short, a moving few moments. 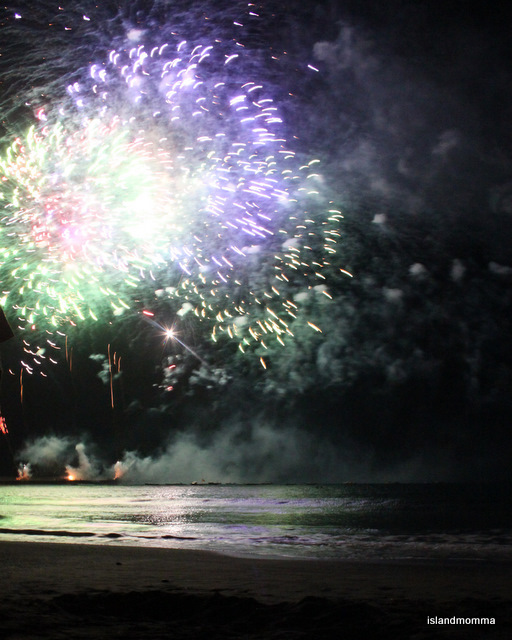 People began to drift away just then, it was, after all, midnight, but no fiesta here is finished until it is marked by a magnificent firework display, and such an auspicious occasion was clearly going to deserve something special, and so it was. A bravura exhibition of Tenerife’s finest, and let me tell you, and I speak here as a total Disney devotee, displays here rival Disney World, and when they are accompanied by the Hallelujah Chorus, the William Tell Overture and (permit me a smile here because some of those pirates were English) Elgar’s Pomp and Circumstance No. 1 they simply ROCK! 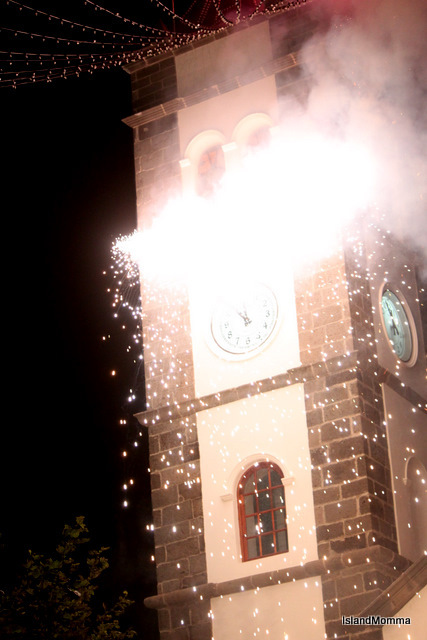 As one, parting gesture, a shower of sparkling rain turned the church tower into a fountain, and it was almost over. All I can say about those boats is that you look on it all as poetic licence. 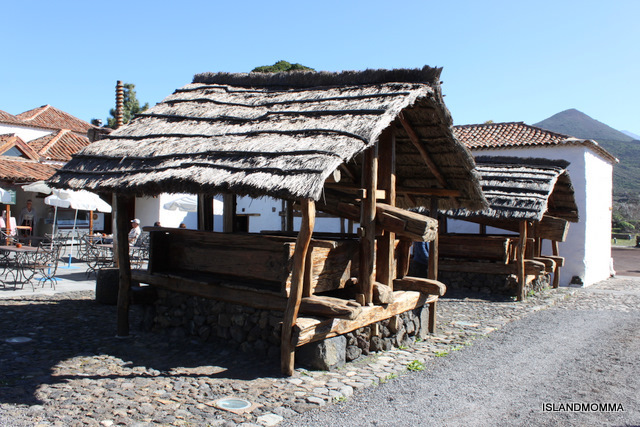 Tenerife certainly was subject to pirate attacks (whether they were privateers or simply criminals), so you can look on the representation as speaking of the island in general, or you can look on the boats as metaphors for the disease which threatened the community. 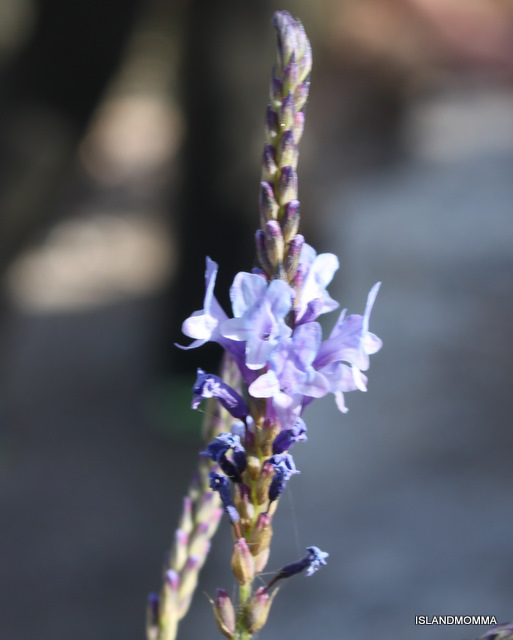 Either way, it triumphed and flourished thereafter. I’m lucky that Cristina likes to drive, which means that I didn’t need to, but I don’t think it was too bad, returning, not tired, but stimulated by the night’s performance. It was well worth the trip, I’d have driven as far again. I know next time won’t be quite the same, because this time, though heard about it, I had no idea just how fabulous it would be, how extremely professional the timing, the acting, the costumes, the lighting would be, nor that we would be sitting for 3 hours. I’d imagined standing. Very few things in life measure up to a first great experience, but maybe in three years’ time I’ll think otherwise! 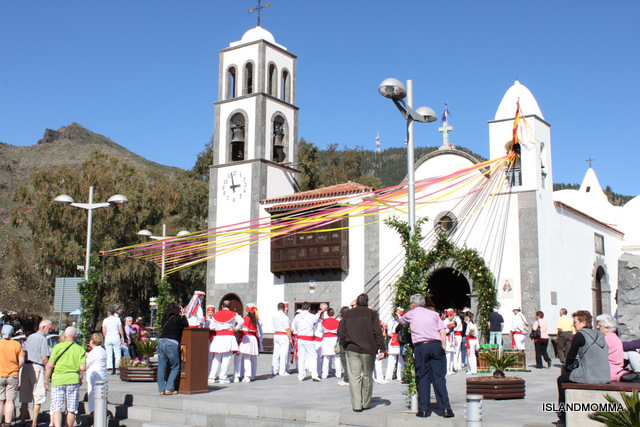 Categories: Canary Islands | Tags: canary islands, festival, fiesta, fireworks, Islas Canarias, la librea, nuestra señora de los remedios, nuestra señora de soccorro, our lady of remedies, pageant, tegueste, tenerife | Permalink. 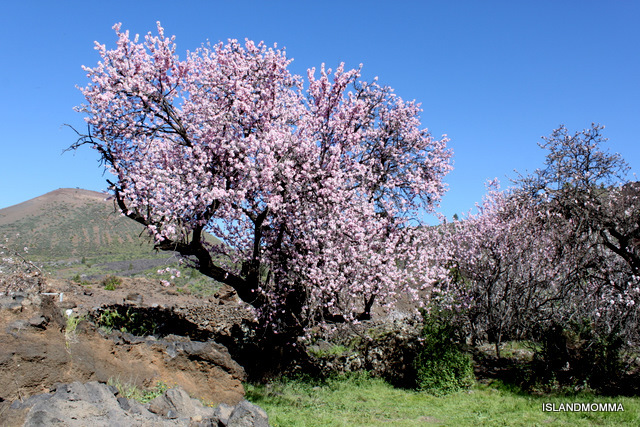 In the week or so since I visited Santiago del Teide I’ve been itching to get back there because I could see that the almond blossom was going to be early this year, and the weather is almost too good to be true since Christmas. 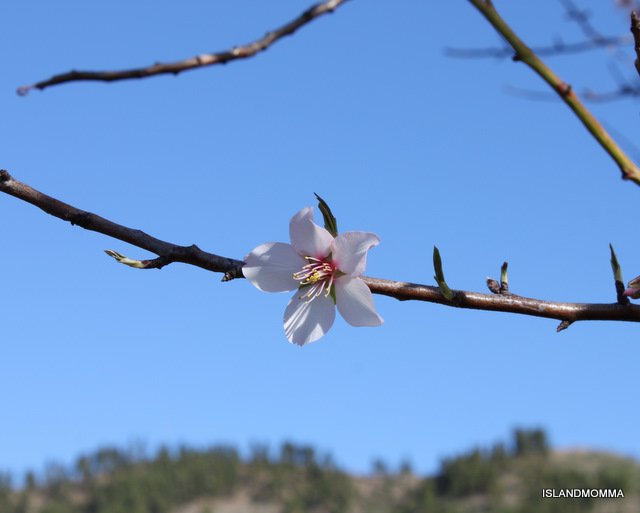 Last year I went the chilly weekend before the official Ruta de las Almendros, and thanked my lucky stars because in the ensuing week the heavens opened, and wind and rain put an end to the blossoms and celebrating them. Now, I should explain that my friend, Maria, and I have decided that we should make a point of regularly going out to look for photo ops, instead of just pointing the camera when one comes up. 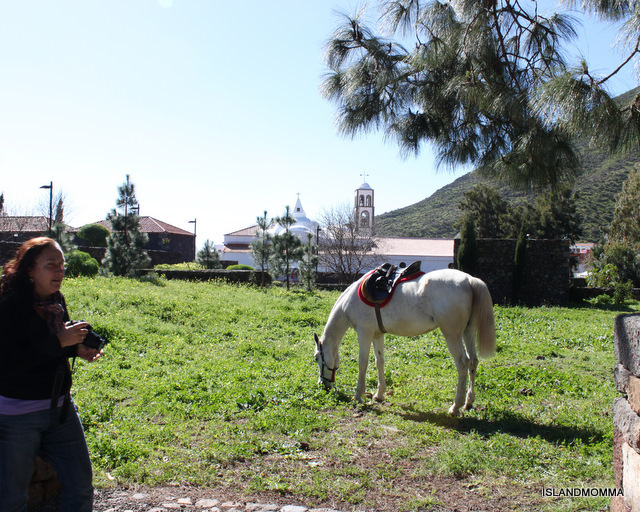 Faced with a stunning vista or a cute baby goat, it’s too late to practise the art, and we both need to practise, so I was really up for making our first sortie to Santiago del Teide! 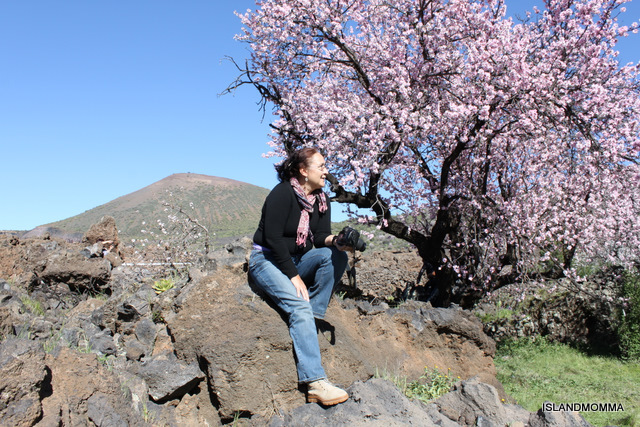 Maria drinking in the scenery. In the background the Chinyero Volcano. We set off early on a morning so crisp and clear you could feel it on your skin, and had the winding roads almost to ourselves. 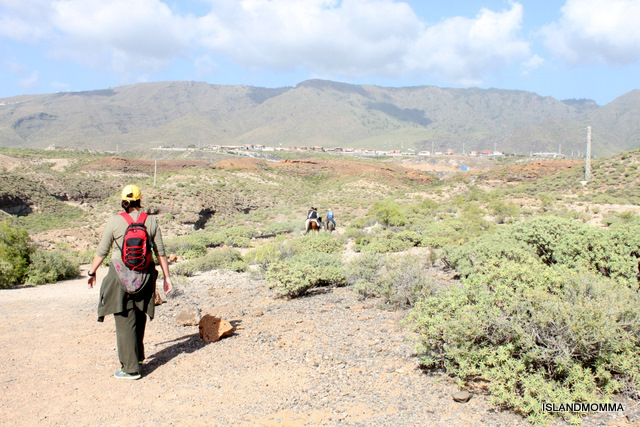 We followed the autopista until it ran out, and then meandered the hillsides to the north-west of the island. 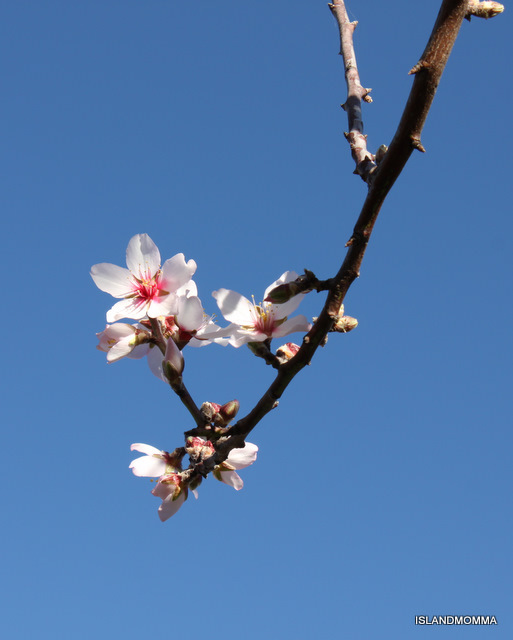 The ocean lay vast and blue off to our left , kestrels hovered above, and we began to glimpse the odd almond tree in all its glory as we neared the village. 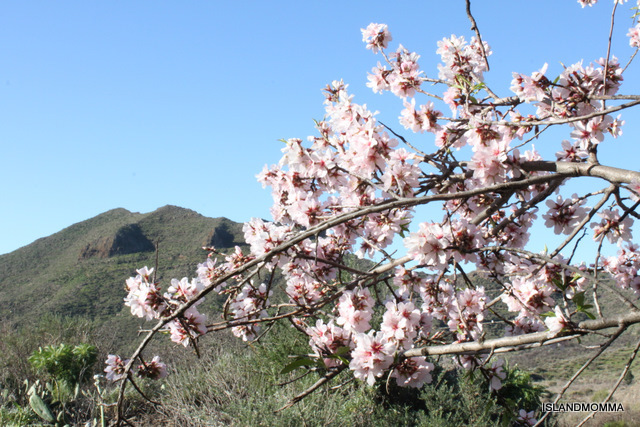 I stupidly missed the turning which takes you a little higher up the mountain, so that you see Santiago del Teide cradled in the valley as you approach, but we did see lots of blossom by the roadsides, so we were, as my sons would say, stoked by the time we arrived. 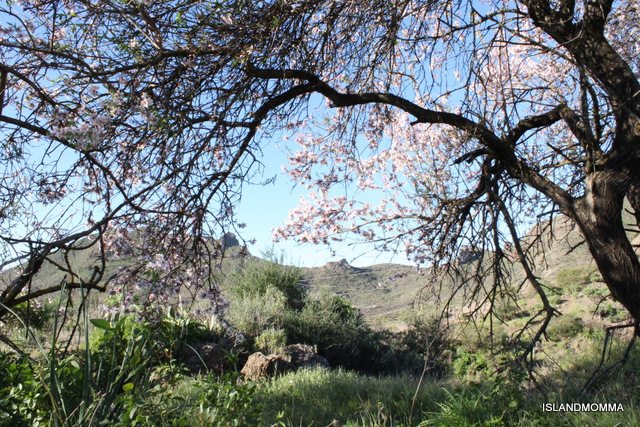 We hung out on the outskirts of the village, snapping happily away in the stunning, still early-morning light, stopping for a while to chat to a lovely man who was strolling down from Valle de Arriba, a tiny hamlet close to the village, who spoke with pride of the numbers of people who now come to see the spectacular blossoms. He reckoned that this year they are a month ahead of where they normally are, so good thing, going on Sunday. I just lost track of time, playing with exposures and the changing light and such, but the time came when we were over-ready for coffee. You know how it is when you make the perfect coffee? Well I’d done that in the early morning, remarkable, considering the hour, poured it into my thermal mug and then totally forgot about it as we chatted our way en route, so there might have been a kind of withdrawal symptom thing going on, since I like my coffee scalding hot. 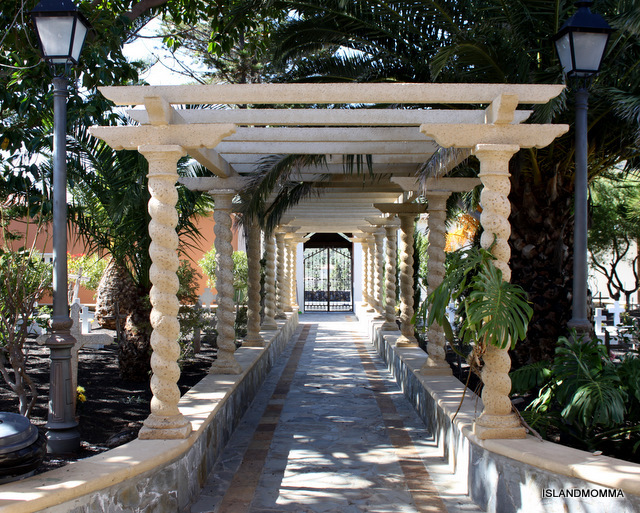 We headed for Señorio del Valle, a complex which includes rural hotel, museum, small art gallery and gift shop, in a setting so bucolic you might be forgiven for thinking you’d landed in the middle of a film set. There, we drank milky coffees and nibbled tortilla española in the courtyard until the violent clanging of the bells from the adjacent church of San Fernando Rey disturbed our relaxation, and we remembered that the charming man we’d spoken to earlier had reminded us it was the feast of St Anthony Abbott, so we coppered up and strolled around to see what was going on. 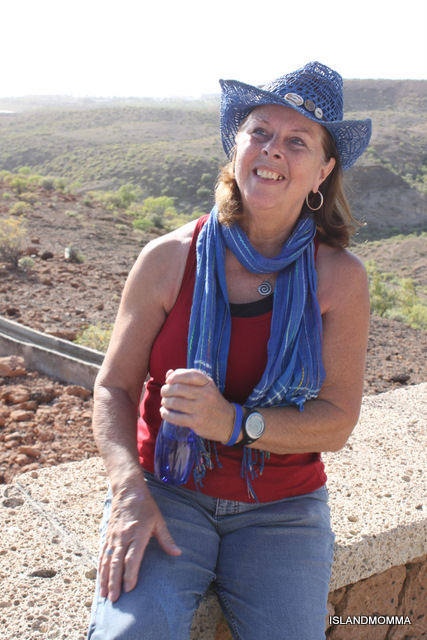 It was one of those delightful, unexpected moments that you sometimes stumble across when travelling (ok I know we’d only travelled about an hour from home – but the journey, not the destination, remember!). 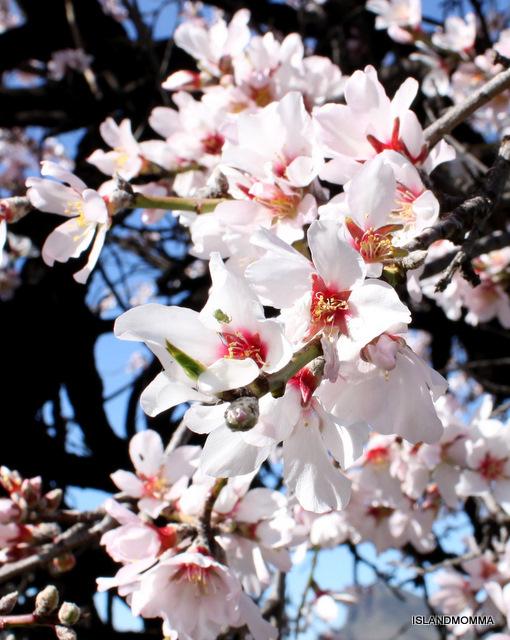 We’d gone to record the blossoms, totally forgetting the feast day. 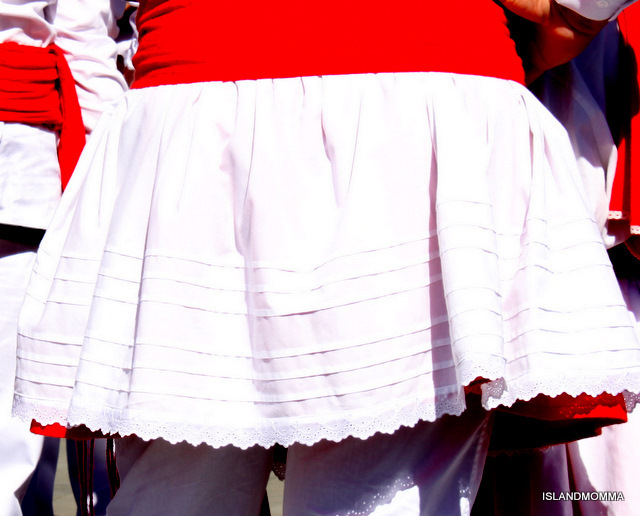 The sight which greeted us was a troupe of local dancers, dressed in white, trimmed with red, and hats adorned with flowers or feathers and other ornaments, not unlike English Morris Dancers. Those costumes were immaculate, snowy white and beautifully trimmed in embroideries anglaise, and they danced with a great sense of fun and enthusiasm. Maria and I sneaked about, snapping happily away, just a bit high on the color and the ambience. 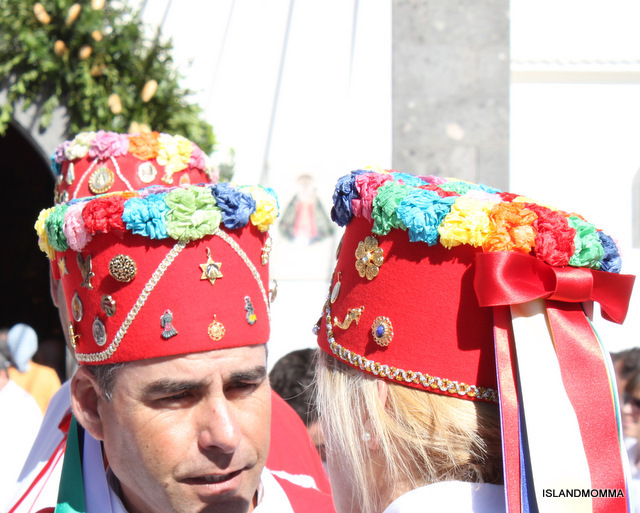 When they stopped, Maria chatted to one of the guys, who told us that those amazing hats are decorated with medallions and charms which are personal to each person, medallions which have been blessed, or charms picked up on travels, and that the origin of the costume lies in the neighboring island of El Hierro. 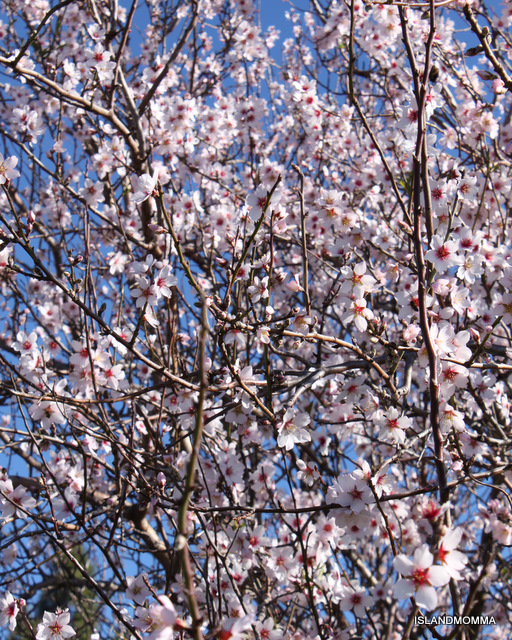 With mass being relayed to the people who couldn’t squeeze into the tiny church, we wandered off down the road I’d followed with my dad a few days back, and further on, noting paths for future walks and admiring more almond blossom until we reached the picturesque village cemetary. Something I’d wanted to do for a few years was to take my camera to a local cemetary after All Souls’ Day on November 1st. Whilst it isn’t celebrated in quite the manner it is in Mexico, where families picnic by the graves of their loved and departed, and sugar candy in the shape of skulls is devoured, it is a day when many families still make a point of visiting and decorating family graves, and I’d imagined that there must be some excellent photo ops. Maybe it was because Christmas wasn’t so far back, but I was moved and happy to see flowers on so many of the graves, just as I imagined it would be after All Souls. 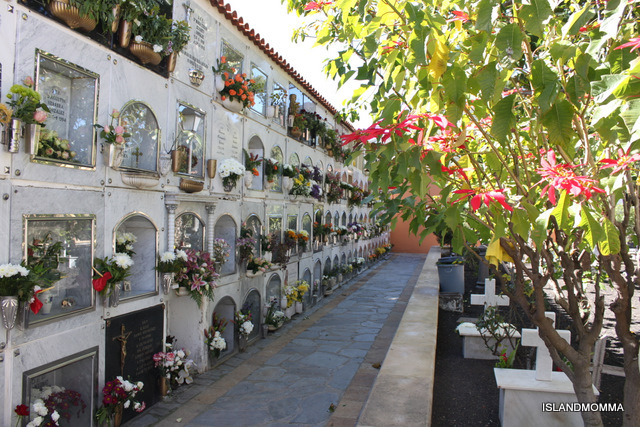 This cemetary was not the dark and forboding place that so many I’ve visited have been, but a riot of color, given that those flowers were symbols of love, it was an emotional sight, and we spoke in whispers as we wandered the tranquil paths and took it all in. 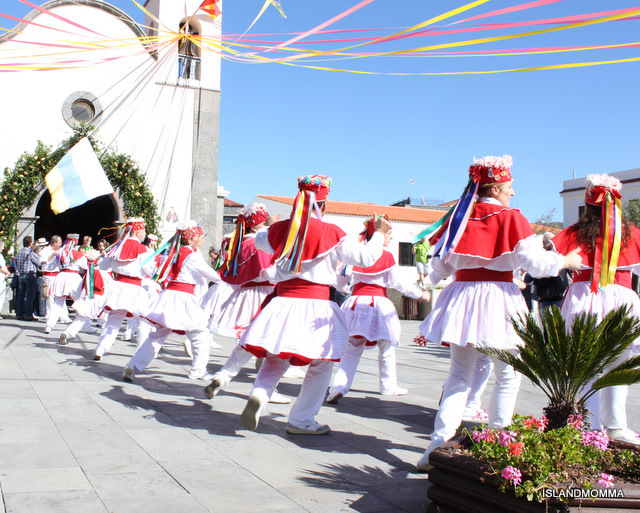 In the distance we heard the church bells tolling again, signalling the end of the mass, and we headed back to the square, to see the procession emerging from the church, preceded by the dancers and drummers, and heading off up a narrow street to bless the community’s animals. I was a bit confused for a while, when I realized that St Anthony is the patron saint of animals. I’d always thought it was St Francis of Assisi, but now I get it. St Anthony Abbott is the patron saint of domestic animals, pets and farm animals, in other words. Reading up on him, other than that he was tempted by the devil who took the form of wild animals, I can’t quite figure why this is, but it makes for some colorful festivals in Spain at least. For complicated reasons I hadn’t gone to the Romeria de Arona this year, which is a much grander affair than this one in Santiago del Teide, but which, basically is a blessing of the local animals, there is also a rather scary festival in the mainland village of San Bartolome de los Pinares, but this happy and gentle festival had a lovely, joyful karma. We followed the procession until it came to the very place where we’d had our morning coffee. The complex offers horse riding and pony and cart rides, has a resident parrot and no doubt other animal associations, and having once been the manor house of the district was possibly always the procession’s first stop. We took the chance to duck into its little museum, which is beautifully appointed, with lots of well-presented information about the Chinyero Volcano, which was the last place in the island to erupt in 1909, the small art gallery and the gift shop, which, actually, was selling local crafts, wines, honey etc and almost nothing “made in China”. It was my fault we had to leave at that point. 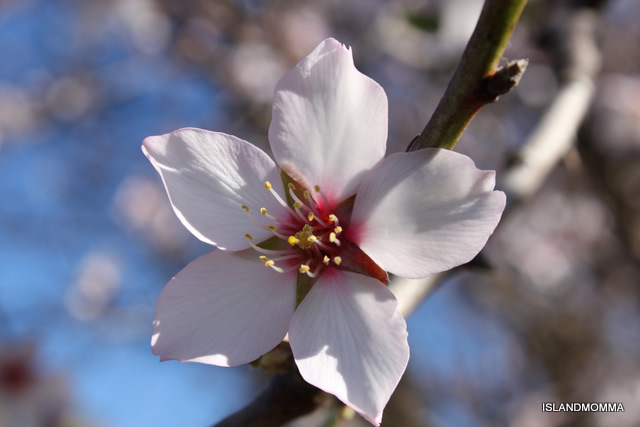 I had commitments for the late afternoon, and I’d come expecting only the almond blossom, which only goes to show that on a small island, where you have spent 20-odd years of your life, you can still find pleasant surprises. I felt guilty about having to go, but my reasons were not light. 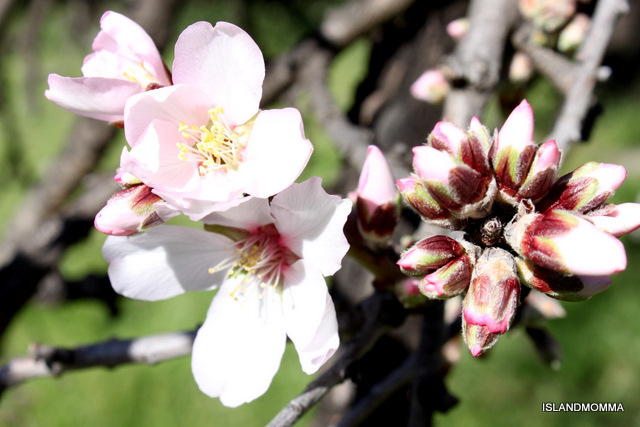 We could have received a blessing from the local priest, who was occupied in blessing the community’s pets as we drove past (we’d seen numerous dogs, a horse, a pony and a tank of turtles as we followed the procession), and I would have been totally over-the-moon with the magnificent blossoms alone. Sometimes life has bonuses. 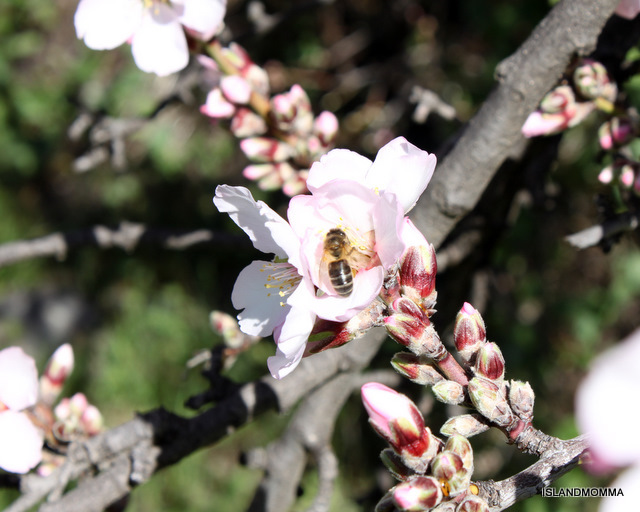 Categories: Uncategorized | Tags: almendras en flor, almond blossom, blossom, canary islands. islas canarias, fiesta, pets, photos, romería, san antionio abad, santiago del teide, señorio del valle, st anthony abbott, tenerie, valle de arriba | Permalink. 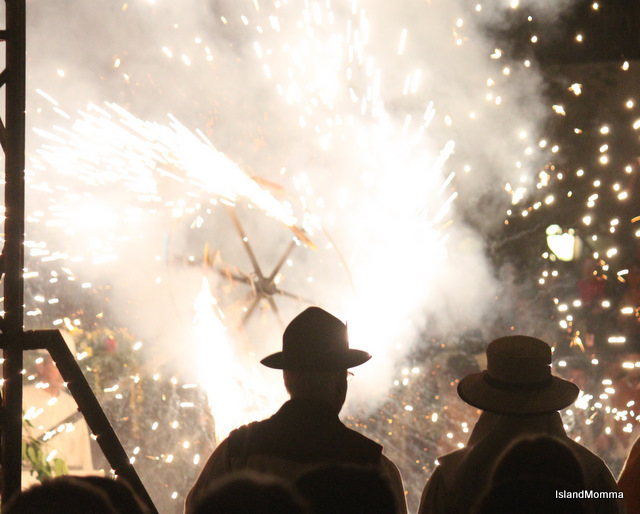 It’s three months already since El Día de las Tradiciones in Chirche, and I only just got around to sorting out the rest of my snaps. Looking back at these costumes now all I can think is how could they stand to wear them in heat which we discovered afterwards was 46ºC??!! 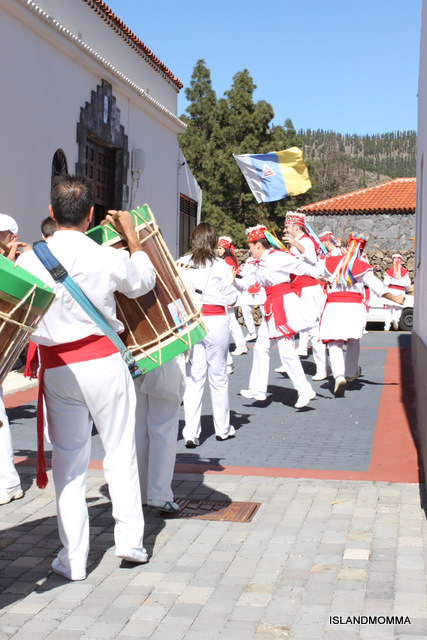 The post is also a chance to give you a taste of the lovely and most famous Canarian folk music group Los Sabandeños. 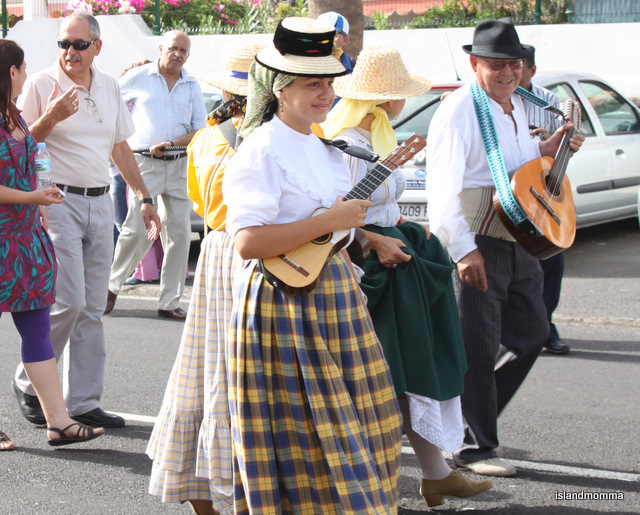 Categories: Canary Islands | Tags: canary islands, chirche, el día de las tradiciones, festival, fiesta, guia de isora, Islas Canarias, living museum, tenerife, traditions | Permalink. In 23 years I’ve been to quite a few fiestas I guess. I remember the first one distinctly. It was in Los Abrigos, back when, to get there, you still had to bump and twist along a road so narrow it reduced to one lane in places , and when the pathway by the harbor was potholed, and you could pull up and park right outside the restaurant at which you’d chosen to eat. The locals had been savvy enough to create restaurants from the buildings along that harbor front by then. I don’t know when the transition from quiet fishing village to “the” place for tourists to eat fish began, but it was when the now-nearby golf monstrosities were only twinkles in the eyes of greedy developers. In 1988 no lesser person than Kevin Keegan told me that his first thought when he arrived in Tenerife was a platter of fresh fish and papas arrugadas in Los Abrigos. 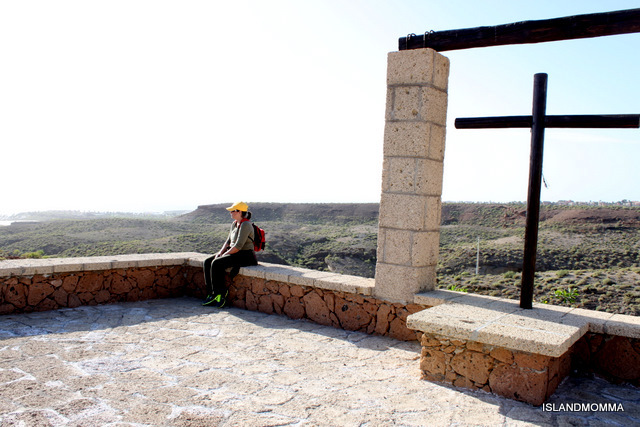 We had arrived in July, and the fiesta there is in September, so we must have very much still been feeling our way around everywhere, when, as we dined right on the roadside, a little procession wound its way past, the men shouldering a religious statue. 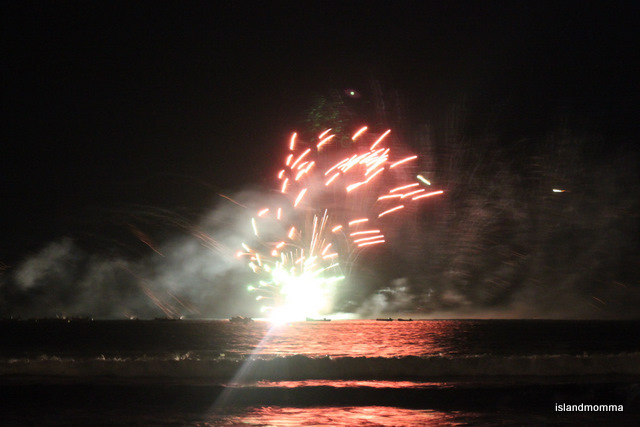 It was a scene I’d seen in the South of France and in movies, so I understood what it was, though we were absolutely knocked out by the firework display which followed the mass and the blessing of the seas. That was something quite remarkable to our northern European eyes. Looking back, I’m surprised how low key the celebrations must have been for us to be taken by surprise by the procession. Today’s Los Abrigos fiestas are much grander affairs, with a firework display which packs the Promenade, sardine-fashion, with hundred of locals, residents and tourists, who have easy access from the smooth road constructed some years back, and which, effectively, put Los Abrigos “on the map” I guess. 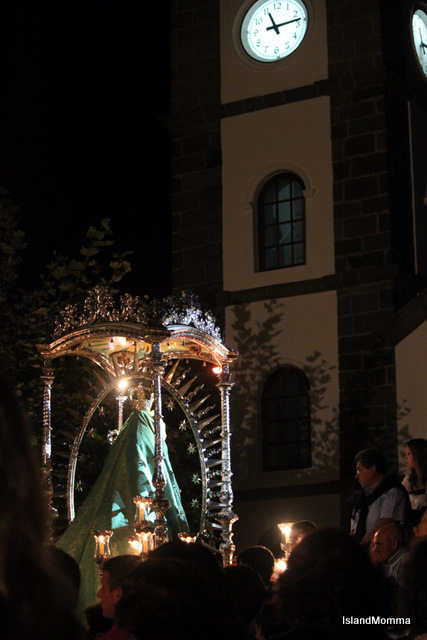 The Sunday procession is still a fairly quiet affair, but visitors to the nightly verbenas, or open-air dances, in the church square party till the wee small hours throughout the week to the latest pop music or salsa……as I found out when I lived there! The village is far too small for anyone not to be affected by the noise! For a while that was my impression of local fiestas – a few, die-hard religious people shouldering the statues and shouting “Viva whoever” as they paraded along the street, great firework displays (arriving in Disney World for the first time the only disappointment was the firework displays – not that they were inferior to Tenerife, just about the same), and lots of boozing and dancing. 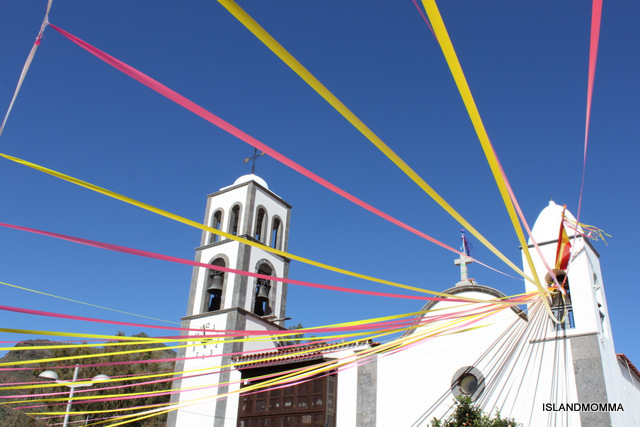 Romerias, as distinct from fiestas, seemed much more traditional, interesting and photogenic. 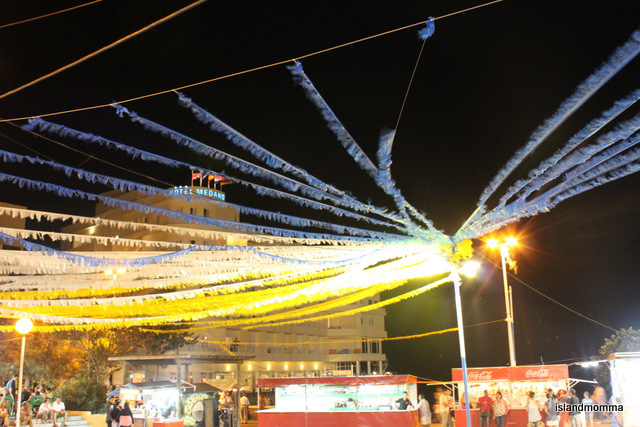 Over the years I learned about different fiestas and romerías (and am not 100% sure what the difference is), some of which I’ve now seen, some of which I’ve seen on tv and some of which I’ve only heard stories. I know that each different celebration of each town or village has its own style, its own personality, and I know that, as the years pass, they evolve, they have changed in my time here. I guess Los Abrigos, having been such a tiny place, well, didn’t really have much in the way of tradition. 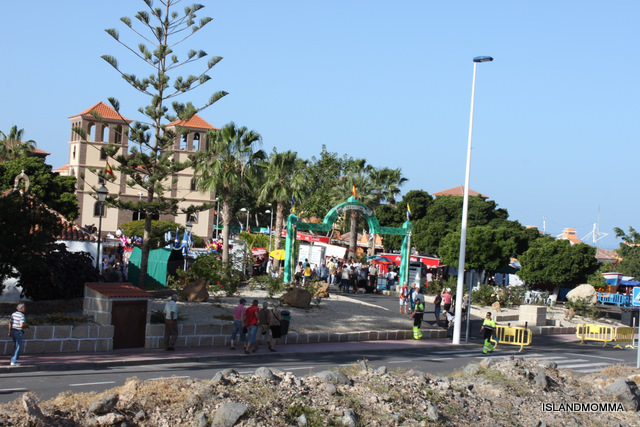 Fiestas in other places have become commercialized, most notably, of course, in Los Cristianos, where it was years before I understood the real traditions behind the wonderful firework display there. Ex-pats and tourists think is put on just for them, and like to mumble and grumble about things “not starting on time” here. Maybe that’s inevitable, Los Cristianos sold its soul years ago. You have to pity El Médano in a way. In some villages now decorations for fiesta are much more extravagant than here, but the almost constant wind can make “short work” of almost anything they put up! At any rate, I was undecided about going to the El Médano fiesta this weekend, but a trot down to the market on Saturday morning, seeing the preparations in the town square, the portabars, festoons and lively atmosphere, which was already in the air, prompted me, and later that evening I arrived just in time to see the statue of Our Lady (don’t ask me which one) being shouldered along the street by the square, being taken to her ringside seat for the fireworks. The truth is that, although there were hundreds of folk there, most of them were there for the firework display. Whilst the procession was winding its way along the streets, most of them were at the fair, buying cotton candy and hotdogs, or throwing back a quick beer, although the rides on the street side did dim their lights and tone down their music as the parade passed. 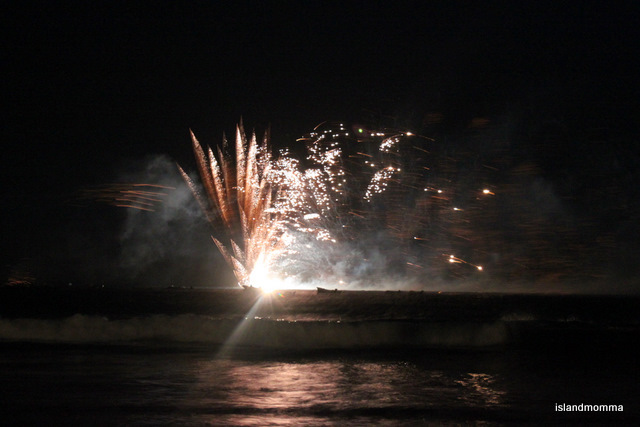 What really prompted me to go was to take some snaps of the fireworks. For the hours I put into the course at the beginning of the year, and for the time I’ve had, I’ve really just totally neglected photography as a hobby. It’s just been a way to record where I’ve been, and I could have done that just as well with my beloved, little Nikon Coolpix. 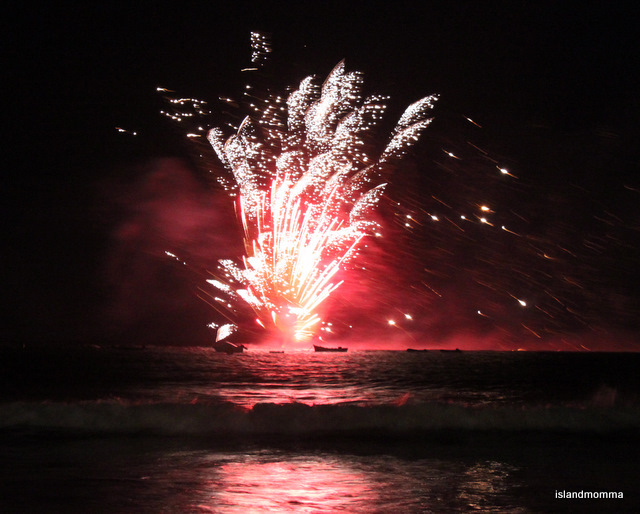 This was my first opportunity to photograph fireworks, and I was surprised to find a decent place on the beach, despite the crowds…..most people don’t want to get sand in their nightime shoes it seems. I perched by a shower, and had a good position to be able to steady the camera, although I had to bum-shuffle across the wet sand a bit when some people came and stood right in front of us (hence they appear in at least one of the following photos!). The procession passed behind me, with its morbid drumbeat and a few scattered “Vivas” (absolutely no wonder that William Booth decided that the devil shouldn’t be the only one to have some jolly music!). The streetlights went out. A kind of little gasp went through the crowd. Then silence, followed seconds later by the first glorious, colorful, exuberant burst lighting up the sky. The show was on. No-one reading this needs to have a firework display described. 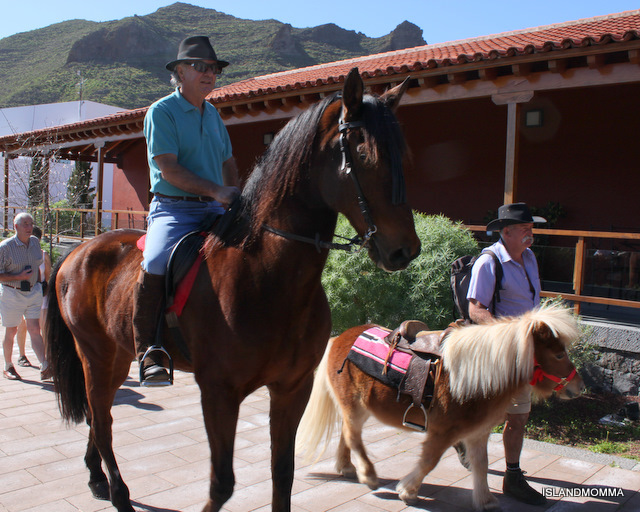 Most of us in the “Western” world are suckers for them, no matter how many we see, and the ones in Tenerife are superb, rivalling Disney, the Olympics and most any others you can think of. 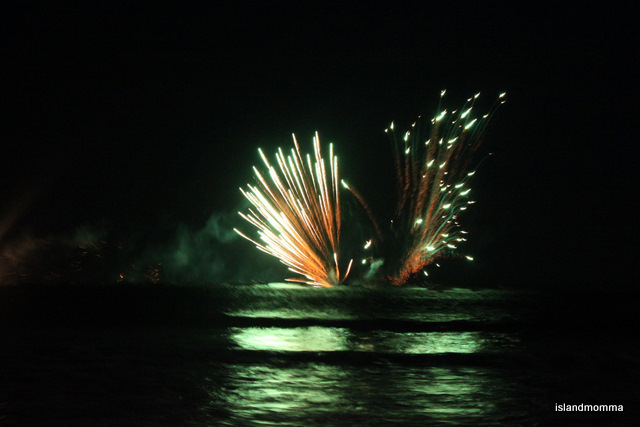 Making the fireworks is one of the few non-tourist and non-agricultural industries here. Remember these were a first attempt when you look at the pictures, please! 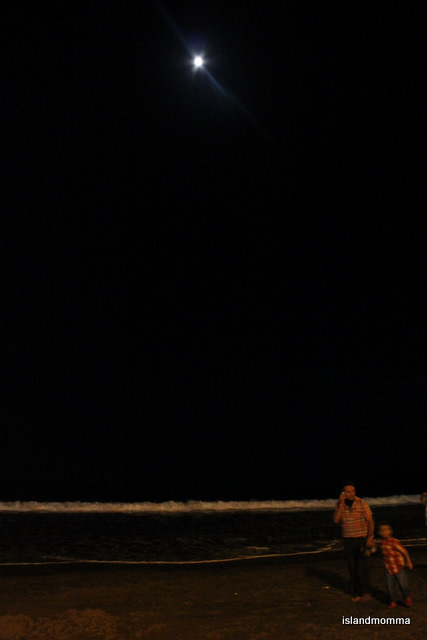 If you squint you can see is two surfer dudes who’d paddled out for a real ringside seat. You can see them in some other shots too, but best in this one. 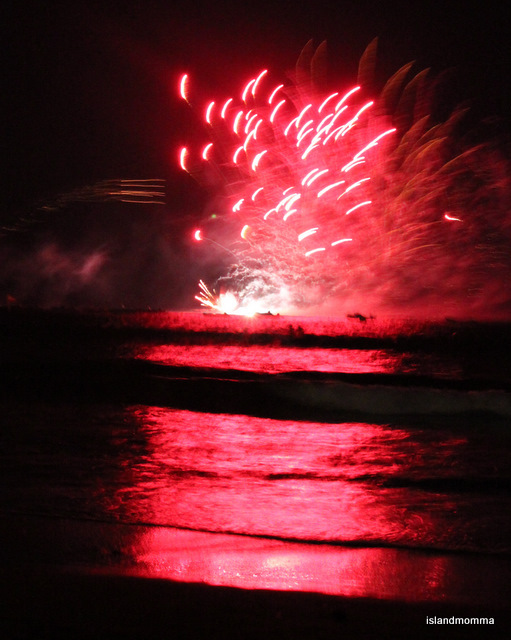 What I hadn’t realized was how the colors of the starbursts and sparkles would bathe the ocean, turning it from red to purple to green according to the color of the display, and how they would reflect off the wet sand as the tide trickled back from the beach. There is a constant internal struggle if you like to snap away. It’s making the decision between immortalizing what you see, and simply turning off the camera and enjoying the spectacle. I tried to do a bit of both. As the last sparkle faded and the air hung heavy with smoke, which made the nostrils twitch, and which even lay on the tongue, the streetlights flickered back on, and Mary was reshouldered to be locked away for another year. It would be logical to think that little will be left when the current generation of old women has died off, but the traditions of the island are so tied to religion that I wonder about that. 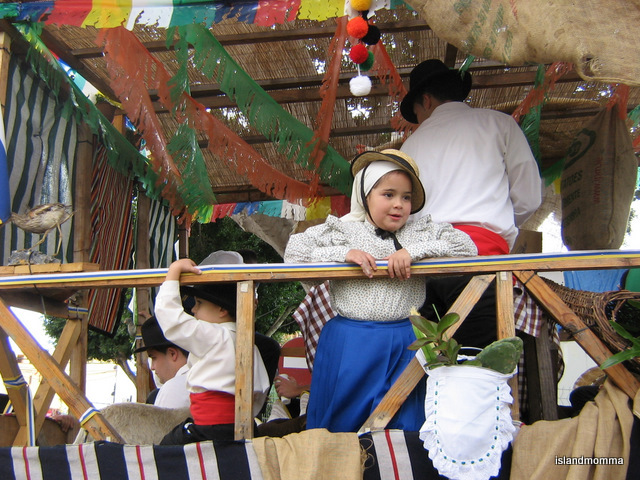 The young seem more eager than ever to keep traditions alive, which seems like a good thing. You certainly can’t beat the sense of fellowship and shared enjoyment which these events bestow on their respective communities, whether that could happen without the religious element I don’t know, but I really would like to think so. What I do know is you can get the best hotdogs eveh (sorry NY! 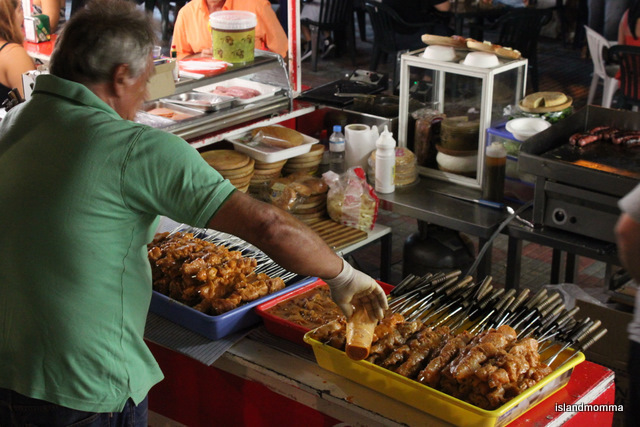 ), the tastiest pinchos and the coldest beers to round off your night. The band hadn’t even struck up when I left, but I was supposed to be up early the next morning…..not so early that I didn’t make time to swing by my favorite ice cream parlor for a quick fix to make the night really complete though! 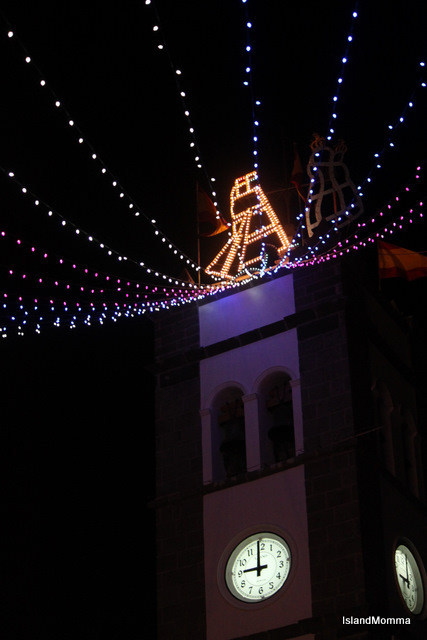 Categories: Canary Islands | Tags: arona, Él Médano, beach, canary islands, festoons, fiesta, fireworks, granadilla de abona, hotdogs, Islas Canarias, los abrigos, pichos, religious statue, romería, tenerife | Permalink. 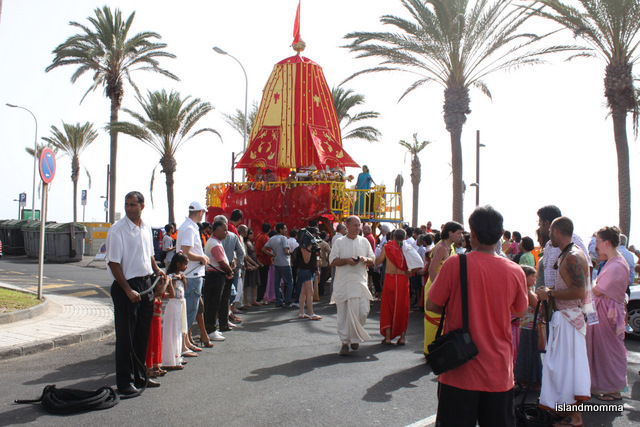 Ratha Yatra: The Festival of the Chariots – Lucky for Spain? 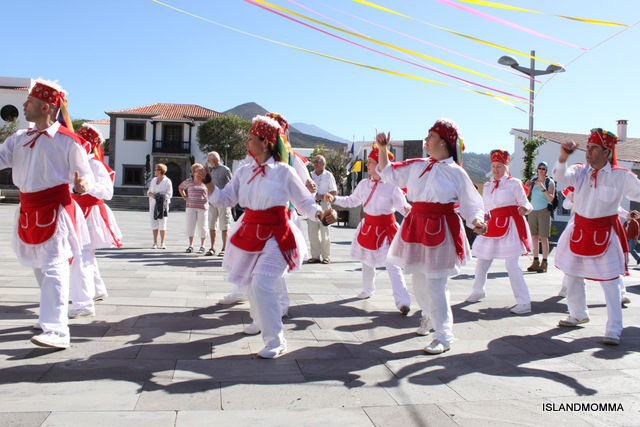 The wonder of living in the south of Tenerife is not just the exposure to Canarian or to Spanish culture, but also to the art, traditions and ideas of a host of other nationalities who have gravitated to this island in the sun. 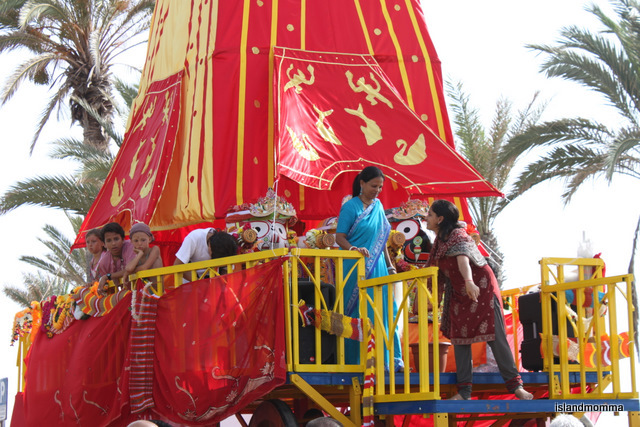 Ratha Yatra is an Indian festival, my reading tells me that the Hindu religion has a whole host of these, each one more colorful than the previous! It might have been a happy coincidence, or it might have been auspicious that the dominant colors of this festival are yellow and red………. as are the colors of the Spanish soccer team – or it might be that there was some sort of karma in the air, because, as the world knows, they won! In the traditional ceremony in Puri in India, where this Festival of Chariots originated, there are three chariots, one for Lord Jagannath (who, so far as I can make out is the same being as Lord Krishna, a name which we, in the West recognize) and one each for his siblings Lord Balaram and Lady Subhadra. Each has their own color Lord Jagannath’s is yellow, Lord Balaram is blue and Lady Subhardra is black, and their colors are draped over the red canopy of the chariot. 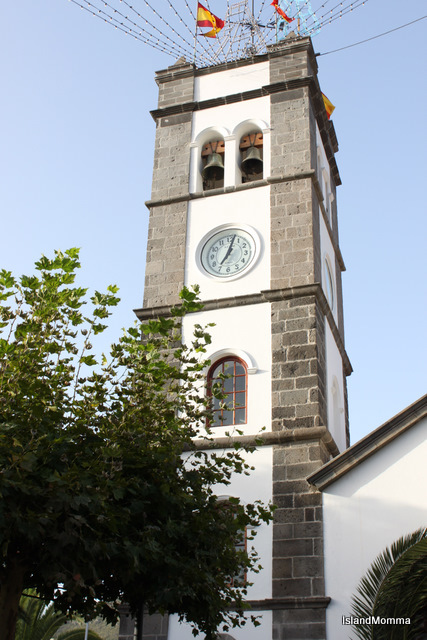 However, in Playa de las Americas on Sunday they had to share, and so red and yellow it was. It was a shame for the organizers that it clashed with the World Cup, but, then, it wasn’t the only event to suffer for that! On Saturday afternoon I went down with some friends to find out what it was all about, but arrived a little early, although it was publicized as starting at around 3.15pm. We did nibble some wonderful samosas, kebabs and other tasty treats, but then retreated in the face of around 30º heat to find a cool place to wait until the real celebrations which were scheduled for 6 o’clock. For me that meant about a half hour of mantras before I had to leave to babysit the most neurotic dog in the world – as some of my neighbours are Uruguayan I knew it was going to get noisy around here regardless of who won!! 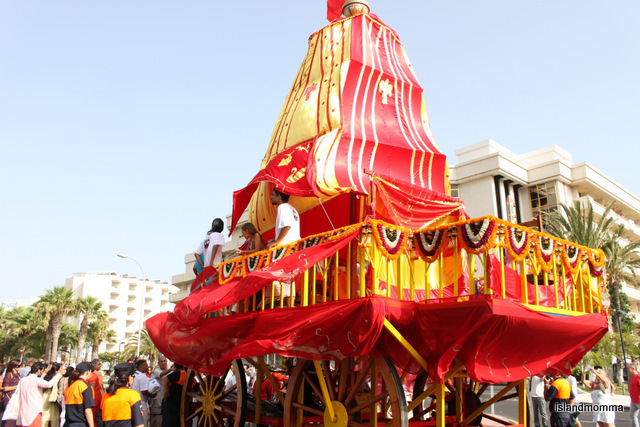 In Puri, once a year the three dignitaries are taken in their heavily decorated chariots from one temple to another. There seems to be a long and complex history surrounding the tradition, but since we had the shortened version of the celebration we also have here the shortened version of the explanation :=) The chariots, or carts, are pulled through the streets by hand, and it is auspicious and pious to be able to help pull the carts, or even just touch the ropes. In India thousands vie for the privilege, but here, of course, there were a few dozen, so no-one was fighting over the honor. This journey is the only occasion on which many people may get to see the deities, foreigners and non-Hindus are not allowed into the temples in which they reside. The feeling of the festival, however, was far from exclusive. The atmosphere was warm, informal and very friendly. We arrived just a bit late to see the transfer of the deities to the cart, but were offered pieces of fresh coconut for good fortune as the procession set off. Apparently, the celebration has spread since the mid-sixties, when our own “gods”, the Beatles, returned from India and people began to take an interest in the religion and culture. 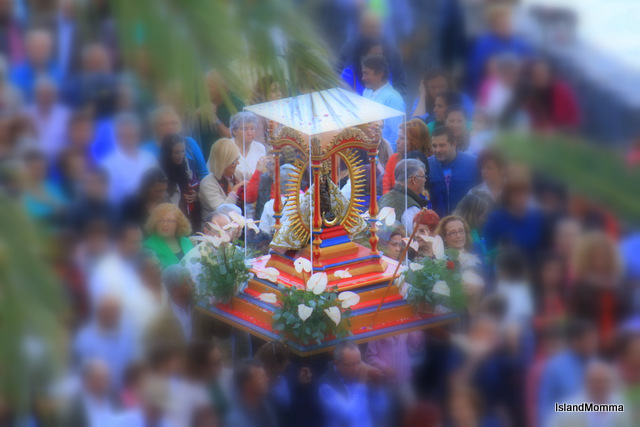 The festival is now celebrated in New York, London, Dallas and San Francisco amongst others – and now Tenerife. any large, overpowering, destructive force or object, as war, a giant battleship, or a powerful football team. 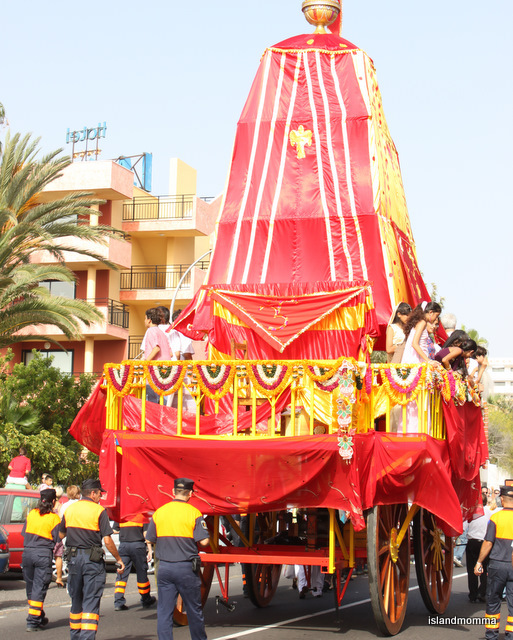 It is typical of the Indian community in Tenerife that they reach out and share, and the chariot was proceeded by a Canrian folk music group, who had also performed the previous evening, talk about having the best of both worlds! 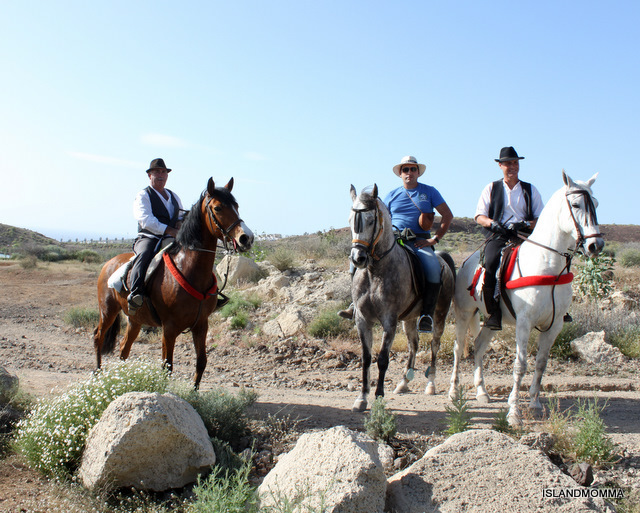 Even this group was something of an oddity to see in the streets of Playa de las Americas, and the gawping faces of some of the tourists were a wonder to behold, more accumstomed as they are to frying on the beach all day, and seeing only their own breed around the streets of town. As the chariot and its attendents moved slowly through the heat of the afternoon on the wide tourist boulevards, the children on atop the cart threw bags, containing nuts and sweets, eagle-eyed, they seemed determined that no-one should miss out, and I thought of the pictures I’d seen on the internet of this festival in its home town of Puri, where thousands of people crowd around, anxious for at least a touch of the ropes or a glimpse of the deities. It doesn’t take an awful lot to stoke the fires of my desire to travel, and this was more than enough. 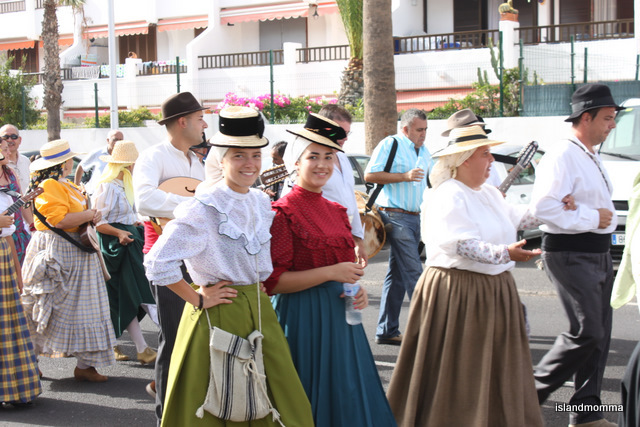 One thing I do know -next year it will not clash with the World Cup, so even if I can’t make it to Puri, at least I can spend more time in Playa de las Americas, making time to see more of the music, drama and dance which are part of the fiesta. 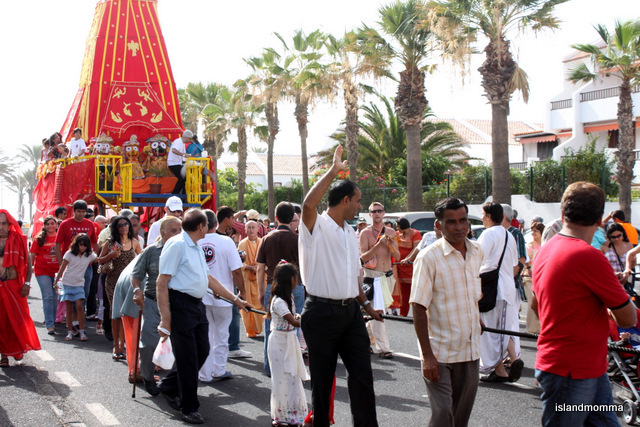 The Indian community of South Tenerife deserve a huge thank you for bringing us this colorful event, and for reaching out to share their culture – something not all other cultures here do! 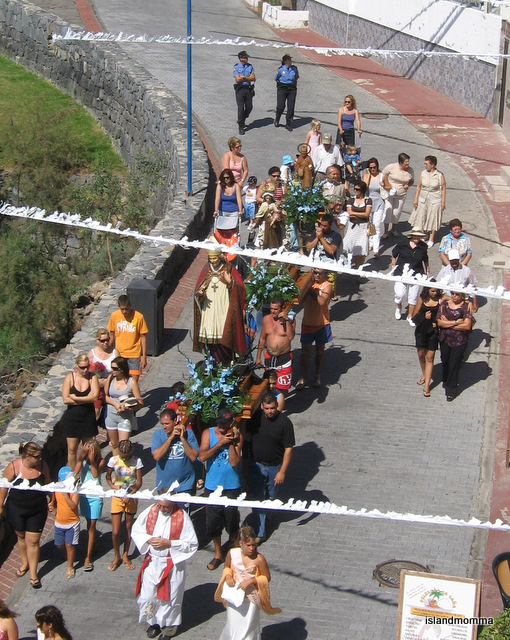 Categories: Uncategorized | Tags: canary islands, colors, fiesta, football, indian festival, Islas Canarias, playa de las americas, ratha yatra, tenerife | Permalink.